The good folks at Amazon recognize that after buying yourself a Galaxy Tab, you’ll probably never have use for their fancy eBook reader, the Kindle. So, you can pick up a copy of the Kindle app free at the Android Market. The first time you start the Kindle app, you may be asked to register or sign in to your Amazon account. Do so. By signing in, you can instantly coordinate your Kindle eBook library with any previous purchases you may have made. The Kindle app’s main interface shows a scrolling list of your eBook library, plus it gives you quick access to the Kindle Store to buy even more books. And everyone should buy more books. 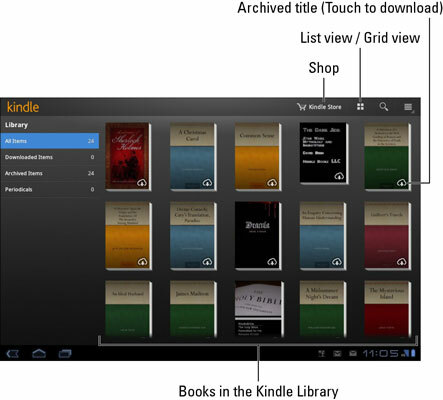 Archived books in the Kindle library are titles you’ve already purchased from the Kindle Store, either online or from another Android or Kindle gizmo. They’re archived because they haven’t yet been transferred to your Galaxy Tab. To do so, touch the title. Consider placing a shortcut to the Kindle app on the Home screen. If you don’t yet have an account on Amazon, get one! Visit and follow the directions to sign up and create an account.